Ok, so now back to 2 kids who can't walk. URGH!!!!!! So, we went to the jumping place (Froggy's in Hayden) and we were there for about 25 minutes when he came up to me saying his toe hurt. He has had a sore on his toe so I thought I would check his toe out. I was expecting blood everywhere if he was saying it hurt because he can't feel from his knees down. I took off his brace and looked at his toe and it looked fine but he was still complaining and wouldn't put any pressure on it. So, we go eat some lunch and when I get home I take off his shoes and braces and low and behold his lower leg was swollen. So, I knew something wasn't right. Well, we ended up going to the ER because his pediatrician and orthopedic doctor were out of the office. After spending all Friday afternoon in the ER, we were told he broke both his small and large bone in the front of his right leg. 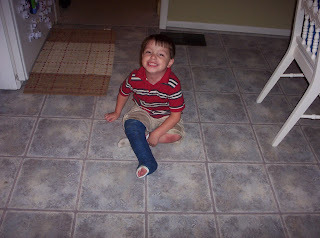 He has to keep the large cast on for 2 weeks and then a short one for 4 weeks. It will definately be interesting keeping this little man down. Whoa!! We are Steven & Heather Horne. We have been together for 15 years and have been married for 10 years. We have two boys. Heath is 8 and Seth is 5.